A mother deliberately started the fire that killed her four-year-old son following a custody battle, the boy's father has claimed. Both Janma Joshi, 40, and Moksha Jai Joshi, known as Jai, died in the blaze in Moscow Drive, Liverpool, on 8 May. 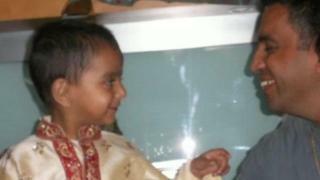 Paresh Patel, of Preston, said Ms Joshi failed to return Jai to him. "It was a case of if she can't have him, I can't," Mr Patel said. Lancashire Safeguarding Children Board is considering a serious case review. Merseyside Police has previously said an accelerant had been used and there was "no evidence of any third-party involvement" in the fire. Mr Patel had won custody of Jai and agreed Ms Joshi could have him during holidays from Howick CE Primary School in Penwortham. However, at the time of the blaze Jai had been there for two-and-a-half weeks and had not attended school. Mr Patel claimed Jai's mother had "some psychological issues" and knew she had no option but to return Jai under the terms of a court order. He claimed her last thought would have been that "she had won", because he had lost his son. Mr Patel criticised the actions of police and social services. "The crux is no one can tell you of the [details] or enforceability of a court order," he said. "After battling for four-and-a-half years to keep him safe... I feel it has all been taken away from me. Merseyside Police confirmed it was aware of the existence of a court order and social service involvement with the family. The force said: "The information provided to Merseyside Police made it clear that the police did not have a power from the court to forcibly remove the child from the address." Lancashire Police said the full circumstances of what happened are being investigated and will be considered at both the inquest on 7 July at Liverpool Coroner's Court and Lancashire Safeguarding Children Board on 2 June. Lancashire County Council said it could not comment if any risks to Jai were known. Mr Patel said: "You never expect your son to die before you."